Book Review: The Little Desert. Published by Rigby Limited, Adelaide, 1975. This is a region in western Victoria, Australia. It is about midway between Melbourne and Adelaide, being about 350km from either city (about 4 hours travel time). It was in earlier times suggested as an area that needed to be cleared from native vegetation and turned into farming land. In the early 1970s, there was a concerted effort made by conservationists to preserve this unique piece of the Australian landscape. Eventually, it was declared a national park and today it is still one of Australia’s most beautiful places to visit. The area known as the Little Desert is not your typical desert. It only has this title due to the soil type. It is very sandy and lacking in essential nutrients, so it would have been very unsuitable for farming without vast amounts of fertiliser. The ‘desert’ as it has always been, and continues to be, is an area rich in plant life. With over 600 species of plants, it is a magnet for botanists, photographers and nature lovers. It also boasts a rich range of native birds and animal species. Most of the national park is covered in mallee trees. Also present in large numbers are smaller shrubby plants and even a range of beautiful native orchids. In the eastern part of the park, one can see larger eucalypt trees, notably along the Wimmera River which flows through this area. Colin Thiele’s beautiful book on this area covers some of the history of the conservation efforts to save this little gem in the Australian landscape. He also describes, in evocative prose, the hidden beauties of this landscape, from the dainty Spider Orchid to the enigmatic Malleefowl, an amazing bird found in the park tending to its enormous nesting mound of sand and rotting vegetation which acts as an incubator to hatch their eggs. Much of Thiele’s prose is closer to poetry, and it is no surprise that he is also known as one of Australia’s leading poets. I will review one of his collections of poetry in a few day’s time. Thiele’s wonderful prose is accompanied by equally wonderful photographs by Jocelyn Burt. She has provided photos for several of his other books. The photos cover the flowers and other botanical marvels, as well as some of the many species of birds resident in this area. Every double-page spread in this volume has a photo on the right with Thiele’s text on the left; each one complements the other. Even though this beautiful part of Australia is only a few hour’s drive from my home, it saddens me to write that I can only ever recall visiting the Little Desert on three occasions, once to camp in our old tent, now decommissioned due to a leaking roof, and the other times were fleeting half-day visits. I must correct that oversight soon. Mallee trees – some of my photos showing the mallee vegetation similar to the Little Desert. Malleefowl – photos of this bird and its nest. The Valley Between – my review of a Colin Thiele novel. It is the sign of a good book when one laughs out loud. I laughed when reading this book, almost on every page and many times on some pages. It is even better if, when I read out a portion to my wife, she laughs out loud too. Or groans – with a roll of the eyes. 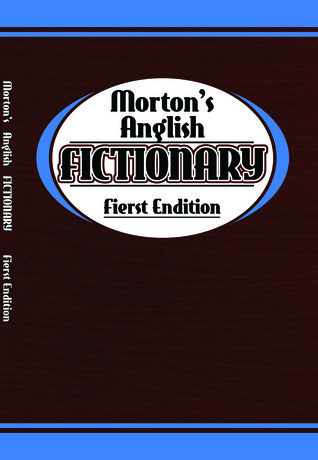 Morton Benning has a winner here with hundreds of neologisms, invented words made by changing one or two letters, all with their own improbable, but highly entertaining, daffynition. Over several years I have seen portions of this amazing volume develop as the author tried out the words and meanings by testing new words on his Facebook friends, also known as contrefutors, many of them adding extras of their own, or modifying suggestions. While I admit that I read right through the book from cover to cover when I received it, and it can be read like that, I think it is best read by dipping into various pages at random. In this way, it is sure to entertain the reader for many years. I notice that the author has called this the Fierst Endition (read the book for daffynitions of those words). I do hope there is not only a seconnd endition, but a theard and more. There is one downside of this work. By the time I was only half way through reading, I was seriously questioning my ability to spell even basic words. Sigh. Grab yourself a copy from here. You won’t regret it. You are currently browsing the archives for the Non Fiction category.